Chris Bach is a lot like you, she loves dogs! She began to study dogs as soon as she was old enough to hold a leash! Her life-long passion has been to get to know all about them. Her goal was to develop a way of training that resulted in prompt, reliable and accurate responses to commands while also maintaining the best relationship possible between dogs and their owners. While growing up, Chris could not have a dog of her own, so she walked and trained neighborhood dogs. 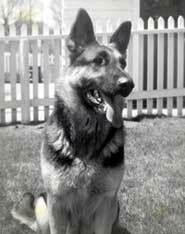 She and her favorite, Heidi, (a German Shepherd Dog), spent many years together walking to a local dog-training club. Because she was too young to join the club, she spent many hours on the side-lines watching and learning. This experience hooked Chris for life on the sport of obedience and put a high priority on teaching dogs skills that would be performed reliably under any circumstances. During these years of observation, she saw many different approaches to training and heard many different theories about dog behavior. She thought that some had positive affects on dogs and owners and some did not. She became determined to find a way to teach that used all the wonderful things she had learned and eliminated all that was not effective and not enjoyable for dogs and people. The result is her unique, innovative, powerful and most importantly, dog-friendly, approach she calls THE THIRD WAY. Flirt and Chris earning one of many career High in Trials As an adult, Chris used THE THIRD WAY to become a top obedience trial competitor. Her first canine partner was a Shetland Sheepdog named Flirt. 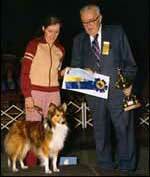 One of their finest achievements was to be the first team in Wisconsin to earn an Obedience Trial Championship (OTCh. ), which is the highest obedience title attainable in the sport! Chris and her Border Collie, Goosey, also earned the OTCh. and along the way was awarded a perfect score of 200, which is an exceptional and very uncommon achievement! When the new title of Utility Dog Excellent was offered, Chris and Goosey were the first in Wisconsin to earn that coveted title. In addition, they also achieved a distinction that will be very difficult to duplicate either in Wisconsin or nationwide: Together they earned nine obedience degrees in ten months, beginning when Goosey was just over one year old. 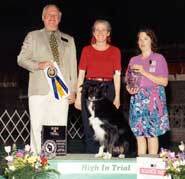 Border Collies Stunner and Baloo were her third and fourth OTCh.'s. Stunner distinquished himself by earning five perfect scores of 200 and 100 High in Trials before he was retired in 2018. Baloo is Chris' current partner and has already earned his first perfect score of 200! However, his perfect score was out of the Utility class, which is a very rare accomplishment in the sport of Obedience! Chris & Zinger with student Kathy & Vadar taking top honors at an obedience trial Chris progressed from successful competitor to having a loyal following of students who also earned many top honors in obedience. In addition, many of them participated successfully in other dog sports including agility, tracking, Schutzhund, herding, fly ball and scent hurdle racing. Their many accomplishments testify to how utilizing THE THIRD WAY produces highly-trained dogs that are also relaxed and reliable, enthusiastic and accurate. To broaden her knowledge and expertise about what people wanted and needed their dogs to learn, Chris branched out into noncompetitive venues. Through local veterinary referrals, she spent years counseling pet owners about behavior and training. She became intimately involved with the service dog industry when she donated one of her well-trained German Shepherd Dogs to a deserving recipient. In addition, her love for working with puppies resulted in her developing a much sought after Puppy Kindergarten class curriculum that is cutting edge in the industry today. Chris was a charter board member of the very prestigious International Association of Animal Behavior Consultants. She was also asked to join the distinguished American Humane Association committee, which brought together top U.S. trainers to build a code of ethics and guidelines for logical and humane dog training. She wrote a series of articles for a renowned dog training magazine and continues to author manuscripts about THE THIRD WAY. 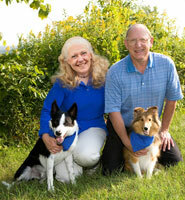 Chris does seminars about dog behavior and training across the United States and Canada and is well-known for her unique and proven approach to teaching reliable skills and enhancing all aspects of the dog/human relationship. THE THIRD WAY has become a global phenomenon and Chris is working towards certifying trainers in well over a dozen countries including South Africa, Malaysia, Australia, New Zealand, Germany, England, Ireland, the Netherlands and many more. Menomonee Falls, Wisconsin is home to Chris, her wonderful and supportive husband, Bill, and their precious pooches Border Collies Stunner and Baloo, Sheltie Doozi, and her future partner, Border Collie youngster Thumper.